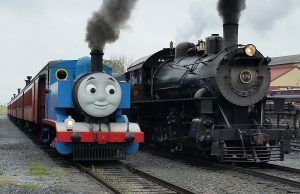 This entry was posted in Children, Culture War, Education, Liberals/Democrats/Left, Taxes, United Nations and tagged inclusivity, multiculturalism, Steam Team, Thomas and Friends, Thomas the Tank Engine, Thomas the Train, UK, UN Department of Public Information's Creative Community Outreach Initiative. Bookmark the permalink. So inanimate objects not just have genders, they must have the politically-correct gender. More leftwing lunacy! I wonder what the granddaughter identifies as? Reverand Awdry must be spinning in his grave. So they have to invent weirdness to be “inclusive” of? Inanimate objects have “feelings” too? Tell me, what’s my middle finger feeling now? This is heartbreaking. The original show was the only quality and moral based show for boys. Then it was bought and rebranded, and now rebranded again. It WAS a great show for boys. It taught great lessons on kindness and friendship and work ethic…and honesty. The songs were beautiful. I’d advise all new parents to find the old dvds at goodwill and don’t watch the new ones. Also, Sesame Street is now new age trash. Engines from Syria pulling cars loaded with explosives? I suppose the gay trains only go through male tunnels, too. And using that logic, would the Channel Tunnel between England & France be considered “bi”, since it goes both ways? Just more globalist communist BS propaganda. I wonder if the people that forked up that Armstrong movie were involved in this somehow? After all, we have to make EVERYBODY feel included – no matter what sh*thole of a country they come from, or which side their bread is buttered on.